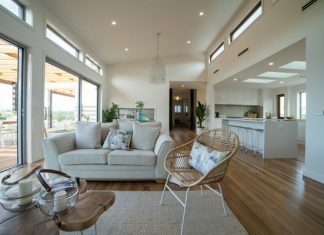 Having just undertaken the exciting process of building her first home, Bec McTighe sat down with Rebecca Skilton to recall what she learnt, what she loved and what she would do differently if she were to build her ‘forever home’ again. Bec McTighe, 26, and her partner Jason Peck, 27, are among Garfield’s newest – and most excited – residents. Nestled in one of the town’s most recent developments, they purchased their 700 square metre block in June 2017, before settling in early August of the same year. At the time of purchase, their street was little more than a paddock with a road running through it. Today, more than ten houses proudly line the street, including Bec and Jason’s 28 square SJD home. But before it became their ‘forever home’, there was one major hurdle the couple had to overcome: the slopping block. “We settled in August (2017), signed with SJD in September but didn’t start building until March,” Bec explained. At 2.8 metres high, Bec and Jason’s concrete retaining wall lengthened their backyard by at least an extra three metres and saved them the hassle – and mess – of attempting to cut their block at a later date. The couple also built their home as close to one side as possible, allowing their driveway to extend right through to the backyard. So, once the block was cut and the house marked out, Bec and Jason had created the optimum amount of space to build their ‘Stanford Mk 2’ SJD home. 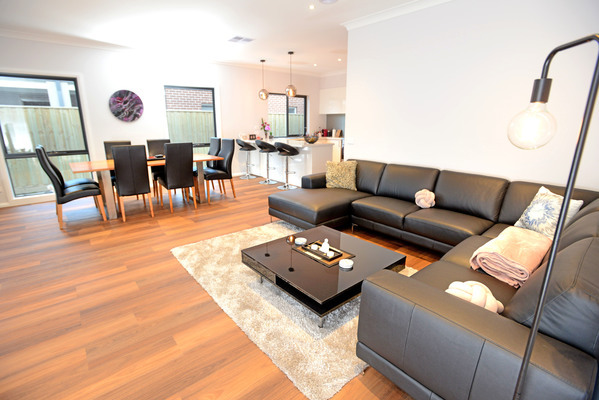 With four bedrooms, two bathrooms and a two car garage, the couple were not only attracted to the home’s practical layout but its abundant storage features and inclusions. Also encouraging was the positive Facebook reviews SJD Homes received. 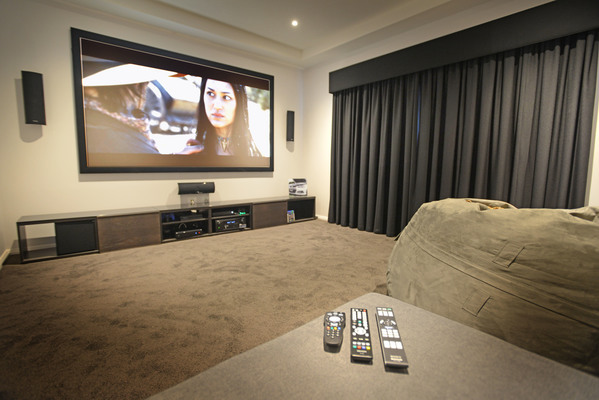 “When we signed our contract with SJD, we got a few things included, which were our nine-foot ceilings, double-glazed windows and 40mm stone benchtops – instead of the standard 20mm. We also got 30 downlights, which was really good because that’s one thing that adds up quick,” Bec said. While layout changes were minimal, Bec and Jason did purchase a few upgrades, including a larger bath and eye-catching matte-black finishes in the bathrooms. And although the home carries a classic charm, two of its notable features include its open-planned master bedroom and ensuite and impressive home theatre. “A theatre is a lot of money but I think it pays off because by the time you’ve got a house, everyone’s pretty much around the same age,” Bec said. But if she had her build-time again, she does admit there is one thing she would change. “I’d definitely add more power points,” Bec said. And Bec’s advice for those looking at building their first home? Take your time and take inspiration from homes – and people – around you. 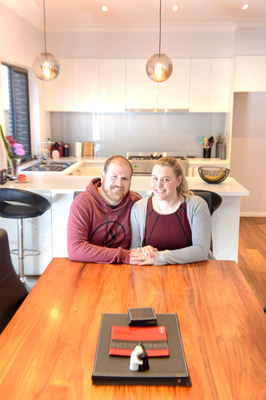 “It’s hard because you’re obviously not living in the house when you’re building it but you need to think about where you’re going to put everything and what you’re going to be doing in certain rooms,” Bec admitted.